My current practice is centered around the use of traditional photographic techniques and material to investigate the boundary between representational artistic creation, based on natural form, and absolute concrete creation, where abstraction takes over and form becomes a compositional structure. The object is always evident in the imagery allowing temporality to remain and merge the subject with the object. Landscape plays a major role in my visual language, particularly the landscape of Scotland, and serves as a source, motif and starting point for my work as it is at once recognizable and more importantly triggers a primal emotive response. The Intertidal Zone‚ is the area of the coastline that lies between high and low tide. Humans reside just above this zone, where we are safe from the powerful elemental forces exerted by the Earth and Moon as gravity pulls the tide towards the land twice daily. To experience this landscape fully is to realize what a hostile and alien place it is, inhabitable only by the hardiest of organisms adapted to an environment of harsh extremes in a constant state of flux. 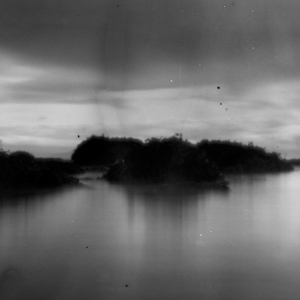 These images are created using hand constructed pinhole cameras that are purpose built to withstand the degrading effects of saltwater and the action of the waves. Incoming tidal swell is allowed to wash over the camera, often completely submerging it by the end of an exposure. Saltwater and sand come into contact with the photographic material, marking and degrading while at the same time becoming a physical part of the resulting photograph. Within Intertidal‚ there is a tension between order and chaos, representation and abstraction. The constantly predictable elements of the horizon line and three bands of land, sea and sky combine with the unpredictable marks and blemishes that occur when seawater comes into contact with the film and chemicals within. The chaotic nature by which these images are produced mirrors the chaotic nature of the weather and tidal conditions that construct and degrade the beaches photographed. The images are an attempt to capture the essence of this primordial landscape where everything is in flux, and chaos and randomness combine with the constants of the daily tidal movements to create a forbidding but essentially beautiful landscape.